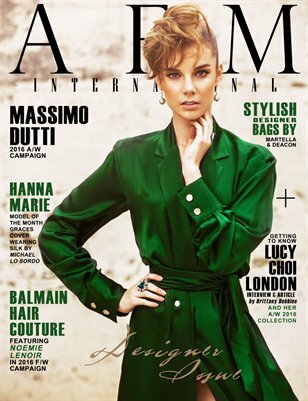 This Issue features Campaigns from Massimo Dutti, Balmain Hair Couture and Saqqara. A Special Interview from Shoe designer Lucy Choi from London. Editorials: Apartment, Designers Day, Pure Elegance and Morvelba. Designers/Brands: Lucy Choi, Moon Chang, Wai Yang, Nico Didonna, Clara Pinto, Atthakrisna Vannason, RWD, Deacon, Martella Bags, Lisa Shahno, Anastazio,Junghans, Muhle and more that shows the creativity and craft of designers. From the established Brands, designers and some talented graduates with such creativity and a unique visions to there first and second collection. These's designers have earned the placement in becoming more exposed to the public eye of fashion and publication. Looks to be the future brands to come.